Opportunity Rising Foundation recognizes that North Texas families have a great need. Approximately 54,000 people are receiving affordable housing through DHA’s programs, and fifty-two percent of those people are under the age of 18. There is a gap between young individuals and the financial resources they need to pursue career training and higher education. In less than five minutes, your gift can help make our first North Texas Giving Day a HUGE success! DONATE ~ When you open the page, click “DONATE”. After a few simple steps, you’re all done. Give if you can and what you can. $5, $20, $50 or more! No gift is too small or too insignificant. 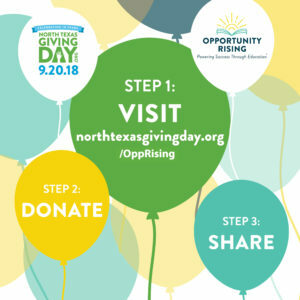 ENCOURAGE ~ Share Opportunity Rising with your friends, family, and followers to encourage them to support us this North Texas Giving Day. You can also visit our Facebook and Twitter pages to like and/or share our posts with your followers.